Among the oldest life forms, algae are simple aquatic plants that form key links in food chains. Some types of bacteria are also considered algae, including cyanobacteria, or "blue-green algae," which is increasingly common across the U.S. Some blooms generate toxins such as microcystin, which can cause nausea, fever and liver damage in humans and kill animals. 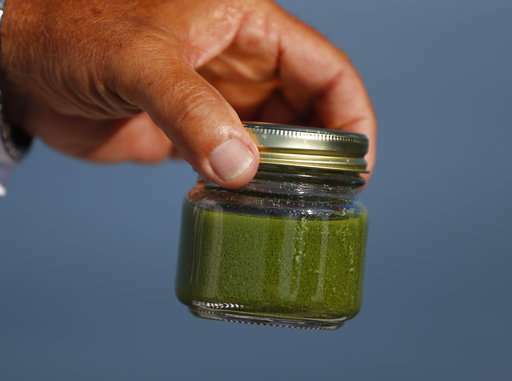 A federal study detected microcystin in nearly 40 percent of lakes sampled around the nation, although mostly at below-harmful levels. Even when blooms aren't toxic, they can turn waters ugly shades of green or other colors, stink like rotten vegetables, foul beaches and kill fish by sucking oxygen from the water as they decompose. Many countries are experiencing "disturbing trends of increasing bloom incidence" and growing economic losses, the National Oceanic and Atmospheric Administration says. China's largest blooms on record washed onto beaches in 2013 from the Yellow Sea, as bulldozers scraped up rotting mats by the ton. A bloom the size of Mexico spreads across the Arabian Sea twice a year. In Australia, blue-green algae extended more than 1,000 miles (1,600 kilometers) on the Murray River in 2016. University of Alberta researchers say microcystin has been detected in more than 240 Canadian water bodies. Lake Winnipeg algae blooms are so large that they're visible from space. 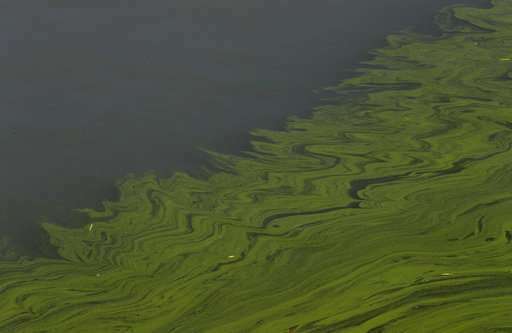 Many scientists believe global warming is making conditions more favorable for algae blooms, primarily by raising water temperatures and causing heavier rainstorms that wash more nutrients into waterways. A study in the journal Science this year said nitrogen runoff into lakes, rivers and bays could increase 19 percent by the end of the century if greenhouse gas emissions keep rising. Congress first enacted legislation to deal with harmful algae in 1998 and has updated it several times, with another version pending. Critics say it's too little and too slow. The five most heavily funded included upgrading irrigation systems; managing brush growth; planting "cover crops" in fall and winter that hold soil in place and absorb fertilizers; stabilizing erosion-prone areas used by livestock; and developing plans for applying fertilizer in ways that will minimize runoff. Another popular measure is planting grass or other vegetation between croplands and streams. Farmers in Sussex County, Delaware, a top chicken-producing area, received $17 million over the seven years, the most of any U.S. county.